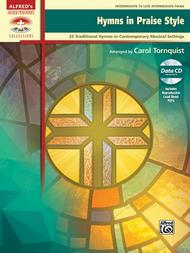 Hymns in Praise Style features 25 treasured hymns, each one well known across denominational lines. These favorite hymns have been arranged by renowned sacred music arranger Carol Tornquist in a contemporary, praise band-friendly style. They can be used as piano solos or as accompaniments for congregational singing. The melodies remain faithful to the originals, but the chords and accompanying rhythms have been modernized. As a bonus, printable PDF lead sheets (the melody line of each hymn with lyrics and chord symbols) are included on an enclosed data CD---making the product easily adaptable to praise-band settings. This unique collection is sure to be a hit with churches that mix traditional and modern worship. Titles: All Hail the Power of Jesus' Name * Amazing Grace * Be Still, My Soul * Be Thou My Vision * Come, Thou Fount of Every Blessing * Crown Him with Many Crowns * Doxology (Version 1) * Doxology (Version 2) * Fairest Lord Jesus * Holy, Holy, Holy * I Surrender All * It Is Well with My Soul * Jesus Loves Me * Jesus Paid It All * Joyful, Joyful, We Adore Thee * A Mighty Fortress Is Our God * My Faith Looks Up to Thee * My Jesus, I Love Thee * Nothing but the Blood * O Worship the King * Only Trust Him * Praise to the Lord, the Almighty * Rock of Ages * The Solid Rock * 'Tis So Sweet to Trust in Jesus * When I Survey the Wondrous Cross.